Future Funk Squad have always, in my book, been a solid source of breakbeat tunes. Although FFS have often delved headlong into the world of songwriting, and do it extremely well too, it's always been about the more clubby stuff for me. I"m pleased to say that the latest is a return to just that, and it doesn't disappoint. 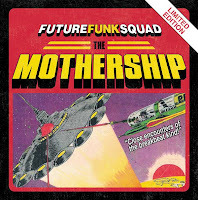 "The Mothership" is a journey back in time to the days when breakbeat was raw, clattering breaks fused with a dirty bassline and sweet synths and sweeps. Topped off with a sci-fi vocal (sounds a bit like Leonard Nimoy to me) this is one that is best served loud! The flipside "Spiders" brings a slightly more laid back vibe with a bubbly Giorgio Moroder style bassline, with fat 80's influenced drums and synth sounds, and again a cheeky sampled vocal. This one's a lot more fun but just as tough! This one's coming out on the awesome En:Vision label, and as yet there's still no sign of that elusive second Future Funk Squad album, but keep an eye out for more singles on the way. Future Funk Squad has also just finished remixing UNKLE's "Restless" and Bomb The Bass' "Old John". More news on those when I have them! Buy "The Mothership" and "Spiders" on 12" vinyl from Juno. All En:Vision releases on Beatport.